Information for this report was provided by a group of more than 40 multidisciplinary experts from local universities, governments, public sector agencies, nonprofits and private sector organizations throughout the San Diego region. Working together, these experts collected the most up-to-date science based on historical data and current trends, as well as complex models that project the various impacts of climate change expected in the region related to extreme weather events, water supply, wildfires, natural resources and public health. To see the full list of scientists, refer to the Scientific Working Groups section on the Contributors and Reviewers page. 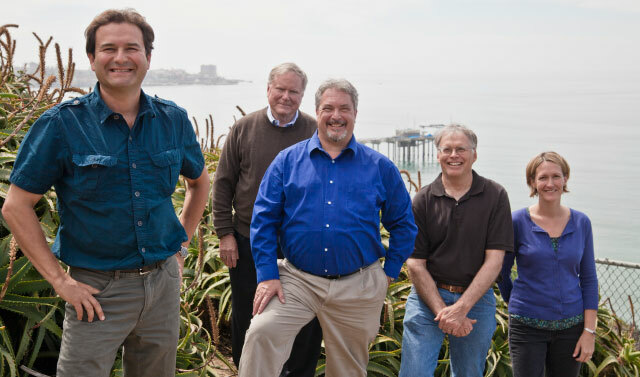 Contributing scientists from Scripps Institution of Oceanography overlooking Scripps Pier: (L-R) Dr. Alexander Gershunov, Dr. Charlie Kennel, Dr. Michel Boudrias, Dr. Dan Cayan and Dr. Kristen Guirguis.